The U.S. coastline was spared from major hurricanes making landfall during the 2010 summer storm season, but the NOAA is saying it’s more likely during the 2011 US hurricane season. 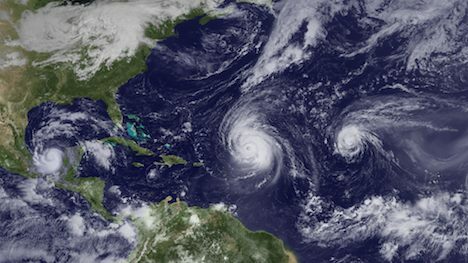 Forecasters from the National Oceanic and Atmospheric Administration (NOAA) are saying that as many as 6 major hurricanes could form in the Atlantic Basin throughout an above-normal 2011 hurricane season. The season, lasting six months, begins June 1st. The NOAA’s Climate Center is predicting 12 to 18 named storms, with winds of 39 mph or more. Of these, 6 to 10 could turn into hurricanes, with winds of 74 mph or more. 3 to 6 of these hurricanes could become major hurricanes of Category 3, 4 or 5, with winds of 111 mph or higher. Each of these ranges has a 70 percent likelihood, the NOAA states. The seasonal average is considered to be 11 named storms, 6 hurricanes, and 2 major hurricanes, so this prediction is significantly higher than normal. said Jane Lubchenco, Ph.D., from the NOAA. 2010 was actually the third most active hurricane season on record, with 19 named storms, but no hurricanes made landfall in the U.S.
Several climate factors have contributed to the above-normal US hurricane season prediction. Atlantic Ocean water is warmer this year. Temperatures are up to 2 degrees Fahrenheit warmer than average. Storms draw strength from the warmer ocean water. La Niña is also a contributing factor. It is expected to dissipate later in the month of June, but its impact is expected to continue into the 2011 hurricane season. La Niña exists when water in the central and eastern tropical Pacific Ocean is cooler than normal. This causes upper-lever winds over the Atlantic to decline, disrupting hurricane formation during the summer. Another factor leading to the prediction is the continuation of the “high activity era”. Since 1995, ocean and atmospheric conditions have been conducive to hurricane development, leading to more active Atlantic hurricane seasons. Notably, hurricane Catarina (different from Katrina), which struck southern Brazil in March 2004, was the first hurricane ever recorded in the South Atlantic. It’s worth noting that this NOAA prediction is not alone in predicting a busy 2011 US hurricane season. Colorado State University meteorologists have made a similar prediction. Obviously, this is not great news for the summer storm season ahead. It seems like the U.S. would do well to heed the advice to not be complacent and be well prepared for what could be a relatively rough ride ahead.